ST. GEORGE – The heat is on and the semifinals are here. The Dixie Rebels semi-pro football team will be at Dixie High School’s Walt Brooks Stadium tonight at 7 p.m. to take on the Wasatch REVolution in the semifinals of the Rocky Mountain Football League playoffs, a rematch of the RMFL championship game that also took place last year at Dixie High between these two teams. Wasatch (6-3) comes into the game on a three-game winning streak. The REVolution beat Treasure Valley in the first-round of the RMFL playoffs last week. Meanwhile, the 7-1 Rebels have not played a game for three weeks. Dixie had a bye in the season’s final regular season Saturday, then enjoyed a bye last week by virtue of its regular season championship. The Rebels are the top seed, having tied the Utah Shock at 7-1 overall, but winning the head-to-head tiebreaker against the Shock. Wasatch is the fourth seed. Dixie has won six games in a row, a streak that started in April against this very REVolution team. The Rebels won the championship handily last year on the strength of their prolific offense and some solid defense, but it wasn’t as easy for them earlier this season when they faced the REVolution back in April. While Dixie won the game, it required the Rebels to pull off some end-of-the-game heroics to come back from a 10-0 halftime deficit. The Rebels eventually won 28-24. REVolution quarterback and former BYU star Charlie Peterson was under constant pressure from the Rebels defensive line in last season’s championship game, keeping the signal-caller off-balance all game. But Peterson had more time to throw in this season’s match-up. It appears that the REVolution have improved their pass protection. 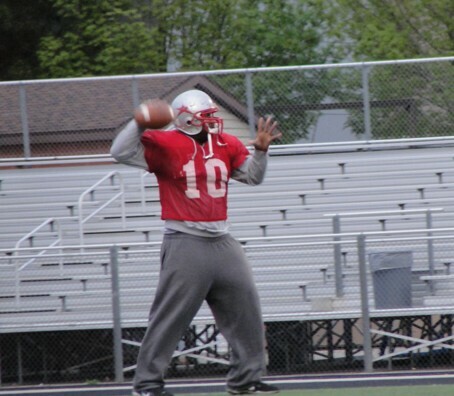 Peterson has been sharp this season as he leads the RMFL in passing yards with nearly 2,000 yards on the year. Wasatch also features former BYU star receiver Eric Drage, who plays wide receiver and is also the team’s offensive coordinator. There are several differences between the game back in April and tonight’s game. In both games Diarra Fields was injured. However, back in April Fields only played in the second half as the team was trying to allow him some time to heal, but determined that they needed him in the second half. Today, Fields is expected to start and play as much as he’s needed. Fahu Tahi played in the game in April, but has since signed with the Jacksonville Jaguars and hasn’t been with the team. However, neither Kyle Coop nor Dallas Irvin, two of the Rebels’ most explosive players, played in April’s regular season match-up. They are both able to dramatically impact the the rushing and passing attacks for the Rebels. Another X-factor in tonight’s game will be the new wrinkle the Rebels have added to their offense. Former Texas A&M star Misi Tupe has played as quarterback in several critical plays in recent games, bringing a speed option play set to the Dixie offense. This could be a big deal because that is not a style that defenses in the RMFL are accustomed to defending. If the Rebels are able to iron out a few obvious problems that they had in their execution of the option, it could add a whole new dimension to the offense. Add that to the standard power rushing attack and Fields’s ability to hit receivers, the Rebels could be very difficult to contain. The Rebels have decided to do something a little different for the game tonight. Normally admission is $5 for everyone over 12, but today it will be free for everyone that brings three cans of food to donate to the Dixie Care and Share.